Behind closed doors, a secret cabal is planning the end of the United States as we know it. Inside a paranoid vision for our time. SINCE HE BEGAN his presidential campaign, Republican candidate Mitt Romney has held more than 125 "Ask Mitt Anything" town hall forums, and the people who have shown up for them have done their best to make the events live up to their name. There have been questions about medical marijuana, about abolishing the income tax, about Romney's Mormonism and his potential vice president. Of course, certain topics come up more than others. One is healthcare. Another is Iraq. A third is the North American Union. The North American Union is a supranational organization, modeled on the European Union, that will soon fuse Canada, the United States, and Mexico into a single economic and political unit. The details are still being worked out by the countries' leaders, but the NAU's central governing body will have the power to nullify the laws of its member states. Goods and people will flow among the three countries unimpeded, aided by a network of continent-girdling superhighways. The US and Canadian dollars, along with the peso, will be phased out and replaced by a common North American currency called the amero. If you haven't heard about the NAU, that may be because its plotters have succeeded in keeping it secret. Or, more likely, because there is no such thing. Government officials say a continental union is out of the question, and economists and political analysts overwhelmingly agree that there will not be a North American Union in our lifetimes. But belief in the NAU - that the plans are very real, and that the nation is poised to lose its independence - has been spreading from its origins in the conservative fringe, coloring political press conferences and candidate question-and-answer sessions, and reaching a kind of critical mass on the campaign trail. Republican presidential candidate and Texas congressman Ron Paul has made the North American Union one of his central issues. As fears of the mythical NAU grow, they appear to be subtly shaping more mainstream debates about immigration and trade. Paul's fellow Republican congressman Virgil Goode introduced a congressional resolution early this year to block the creation of the NAU and the "NAFTA Superhighway System." Similar resolutions have been introduced in several state legislatures - in Montana's case, the resolution passed nearly unanimously. And back in July, the US House of Representatives easily approved a measure that would cut off federal funds for an existing trade group set up by the three countries. The NAU may be the quintessential conspiracy theory for our time, according to scholars studying what the historian Richard Hofstadter famously called the "paranoid style" in American politics. The theory elegantly weaves old fears and new realities into one coherent and all-encompassing plan, and gives a glimpse of where, politically, many Americans are right now: alarmed over immigration, worried about globalization, and - on both sides of the partisan divide - suspicious of the Bush administration's expansive understanding of executive power. The belief in an imminent North American Union, says Mark Fenster, a law professor at the University of Florida and author of a 2001 book on conspiracy theories, "reflects the particular ways in which Americans feel besieged economically, powerless politically, and alienated socially." As a social anxiety, the NAU's roots run deep. Global government and elites who secretly sell out their own citizenry have long been staples of conspiracy theories, thanks in part to the Book of Revelation's warning that world government will be an early indicator of the Apocalypse. Over the centuries, the world's puppeteers have been thought to be, in turn, the Bavarian Illuminati, the Freemasons, the pope, the Jews, international bankers, the League of Nations, the United Nations, the Rockefellers, and the Communist International. For most of the 20th century, American conspiracy theories tended to focus on communist infiltration of the upper echelons of the US government. The founder of the John Birch Society, a leading source of such imagined schemes, accused President Dwight Eisenhower and Secretary of State John Foster Dulles, among many others, of being communist agents. The dissolution of the Soviet Union, the one country that has actually challenged American global preeminence in the postwar period, forced a conceptual adjustment among the conspiracy-minded. In the past two decades, the United Nations and trade groups like the World Trade Organization have figured more prominently in their dark visions. "In the 1990s in particular, with the militia movement, you had all the rumors of black helicopters and jackbooted UN troops," says Chip Berlet, an analyst at the liberal, Somerville-based think tank Political Research Associates. "There was this sense that the secret elites behind the UN were the same secret elites who had been behind the Soviet Union." Recently, other threads have emerged. The 1994 birth of NAFTA gave new strength to worries that free trade would cripple the American middle class. In the past two years, immigration has once again thrust itself into the national political discussion. And the once-mighty dollar has entered a steady decline that shows no signs of ending - in sharp contrast to the strength of the euro, the new currency of an economically united Europe. In March 2005, those seemingly disparate worries found a banner under which they could unite. President Bush, along with then-President Vicente Fox of Mexico and then-Prime Minister Paul Martin of Canada, held a summit in Waco, Texas, and announced the creation of the Security and Prosperity Partnership, a framework for greater continental cooperation on trade and security issues. Alarmed at the fact that the United States had entered into the arrangement without explicit congressional approval, and by what they saw as a lack of public detail about the meetings, a few conservative activists became convinced that the SPP was the first step in a secret plan to dissolve the three nations into one continental unit. Their suspicions were further inflamed when, two months later, a working group at the Council on Foreign Relations, a think tank long viewed with suspicion by the conspiratorial fringe, published a report called "Building a North American Community." The report recommended the establishment of a common North American security perimeter, the development of biometric North American border passes, and the adoption of a common North American tariff. One of the vice chairs of the council's working group was a political science professor at American University and former Carter administration official named Robert Pastor. In 2001, Pastor had written a book arguing for greater economic integration between the three North American nations - and specifically discussed the possibility that the nations could jointly adopt an amero currency. A fully realized theory was born. In the fall of 2006, Phyllis Schlafly, along with the conservative author Jerome Corsi and Howard Phillips, founder of an organization called the Conservative Caucus, started a website dedicated to quashing the coming North American "Socialist mega-state." If the anti-NAU cause has a prophet, it is Corsi. In 2004, Corsi was a leading spokesman for Swift Boat Veterans for Truth; last year, he co-wrote a book on the Minuteman Project with its founder, Jim Gilchrist. Earlier this year Corsi published a book, "The Late Great U.S.A.," and it was here - and in his columns on the conservative websites WorldNetDaily and Human Events - that the NAU conspiracy theory emerged in full flower. A new continental government will grow out of the tri-national working groups set up by the SPP, complete with bureaucratic agencies outranking the three national legislatures, and a North American Court able to overrule national courts. There is talk, Corsi writes, of issuing North American passports, and of meshing the three nations' militaries. And the infrastructural backbone of the sprawling new superstate is already being built: The NAFTA Superhighway, a "four-football-fields wide" Mississippi of concrete and rail along which goods, cheap labor, narcotics, terrorists, and pandemics will flow unimpeded from Mexico (and, via Mexico's Pacific ports, from China) into the United States and on to Canada. Corsi said in an interview that his belief in the NAU stemmed from his realization that it was the only logical explanation for the Bush administration's refusal to police the US-Mexico border adequately. "I kept asking myself why, six years into the war on terror, was Bush not securing the border?" he said. When he heard about the SPP, he had his answer: Bush, bent on creating the NAU, saw the border as a near-anachronism, fated for irrelevance in a North American superstate. "He's creating a fait accompli," said Corsi. "First you change the North American reality, then you can change the regulations." Corsi's warning cry and gift for detail have given the theory traction in circles where anxieties about immigration and corporate oligarchy intersect. Lou Dobbs, whose CNN show portrays both free trade and increased immigration as sops to multinational corporations and body blows to the middle class, has devoted investigative segments to the NAU, the amero, and the NAFTA Superhighway. The John Birch Society a month ago devoted an entire issue of its magazine to the NAU. So how real is the NAU? In the literal sense, not very. Its underpinnings turn out to be a hodgepodge of mostly unconnected facts and suppositions. But the very existence of the theory is starting to have an influence of its own, and the concerns it represents suggest a new kind of anxiety that crosses traditional political boundaries. The SPP does exist, and its tri-national task forces continue to meet, but its members consider it a way for the United States, Canada, and Mexico to collaborate on issues such as customs, environmental and safety regulations, narcotics smuggling, and terrorism. The amero, on the other hand, appears to be purely theoretical. It was first proposed in 1999 by a Canadian economist named Herbert Grubel, when the euro was first entering circulation. Grubel says he did manage to interest Vicente Fox in the idea, but whenever he brought up the topic with American officials, he recalls, he got nowhere. "There wouldn't be very much benefit for the United States" in an amero, he concedes. The NAFTA Superhighway has a more complicated origin. One piece is a nonprofit organization, called the North America's Supercorridor Coalition, or NASCO, dedicated to ensuring the efficiency and safety of some of the country's major truck trade routes - a map from the organization's website has shown up on NAU watchdog websites, erroneously labeled the blueprint for the NAFTA Superhighway. Another is a controversial toll highway that Texas is considering building to accommodate the sharp increase in freight traffic brought by NAFTA. These constituent parts are a long way from the many-tentacled conspiracy that Corsi and other see. But the theory still has managed to make itself felt. Frank Conde, the director of communications for NASCO, believes that fears of an NAU are preventing the North American countries from having long-overdue discussions. US-Mexico trade has quadrupled since 1993, and at $540 billion, the US-Canada trading relationship is the largest in the world. He argues that making economic relations among the three nations more efficient is no more than responsible stewardship. "This country has never really had a national strategy to service the huge increase in trade that came about as a part of NAFTA," he says. "The worst damage that [anti-NAU activists] are doing is distracting political leaders at all levels, and preventing us from putting together that policy." In a deeper sense, the apprehension and anger that sustain the NAU rumors are quite real. For all their talk about national threats, national sovereignty, and national strength, conspiracy theories are usually more about individual powerlessness, says the University of Florida's Fenster. They are a form of political populism, with its suspicion of concentrations of control and its sense that ordinary people are being shut out of the decision-making process. And the issues around which those theories grow up are as good a Rorschach as any, not so much of people's concern about their country overall, but about their own place in it. The surprising prevalence of NAU suspicions also suggests a desire for fresh thinking from America's two major political parties. In the United States, trade and immigration divide more along class lines than party lines: wealthy Democrats and Republicans tend to support free trade and more immigration, poorer Democrats and Republicans don't. In neatly linking free trade and increased immigration together into one international plot, the NAU has the potential to appeal to both left and right. 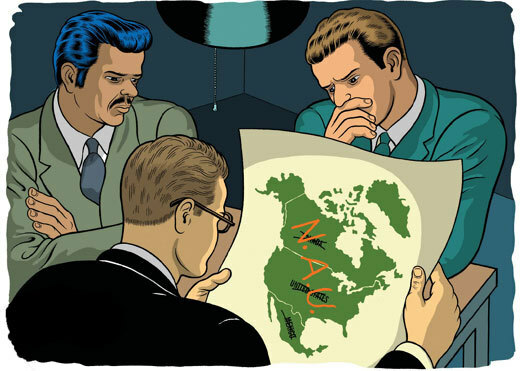 Indeed, while the threat of a continental merger is, in the United States, primarily a conservative concern, in Canada it has its greatest resonance on the left, where it is seen as an attempt by American business interests to take over our northern neighbor, dismantle its social services, and privatize its abundant natural resources. The Council of Canadians, a progressive advocacy group that claims more than 100,000 members, has made the threat of "deep integration" with the United States one of its central causes. To some analysts, it's a sign of how far apprehension about globalization - whether of money or people or goods - has spread. "It's easier to blame the North American Union, or some world government, than an increasingly globalized market," says Pepper Culpepper, an associate professor at Harvard's Kennedy School of Government. With US trade projected to grow even faster in the coming years, the economic dislocations, and the resulting anxieties, are likely to increase. So while the North American Union may not exist, we surely haven't heard the last of it.